Hey Boys & Girls: Memory Laps(e) be rocking Legends Cafe, Lebanon PA, this Friday night (June 20) with a special custom designed family friendly set list. 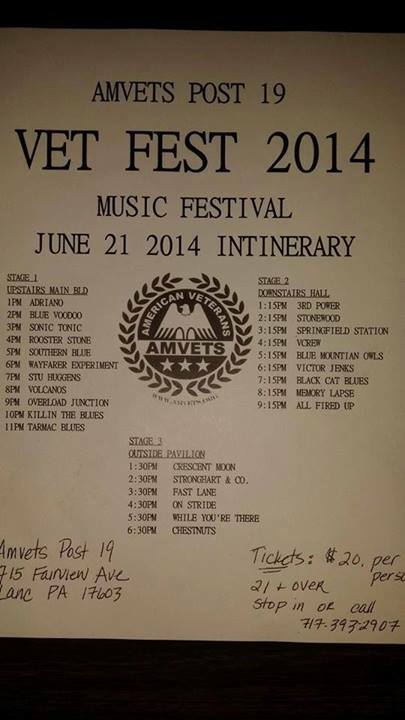 Music is 7-9 p.m.
We’ll be adding some Memory Laps(e) tunes to the Vet Fest 2014 at AMVETS Post 19, Lancaster PA, on Saturday (June 21). Lots of great bands all day on 3 stages. The music starts at 1 p.m. and Memory Laps(e) will be playing a set on Stage 2, starting at 8:15 p.m. Ticket price is $20 and the event benefits our veterans. Come on out and support a great cause.